DETROIT — Five-year-old Annabelle Murphy of Sterling Heights, Mich., who was born without a left hand and forearm, doesn't consider her electronic arm anything out of the ordinary. Sensors tucked inside her arm charge three fingers on her hand that let her pick up jelly beans and uncap magic markers. She's learning to tie her shoelaces, no easy task for many kids her age. She can bat a ball and helps other kids open their fruit snacks if they have trouble tearing open the bag. A program at Children's Hospital of Michigan provides the prosthetic arms and hands and therapy to children who are uninsured or whose insurance doesn't fully pay for the devices. It also maintains a limb bank used for replacement parts. The Variety Myoelectric Center, based at the hospital's Novi outpatient rehabilitation center, is thought to be the only facility of its kind in North America. It has fitted more than 500 kids like Annabelle with electric-powered — myoelectric — limbs since it opened in 1981. The program has been funded since its inception by Variety, the Children's Charity of Detroit, which holds an annual fund-raiser to raise money for the program. "Without the help from Variety, we couldn't do this," said Edward Dabrowski, a pediatric rehabilitation medicine physician and medical director of the center. The center was the idea of Milton London, a Variety Club supporter, and Lawrence Morawa, a Wayne State University orthopedic surgeon, who got the program running more than 30 years ago with the help of a three-generation Livonia family business called the Michigan Institute for Electronic Limb Development. At the time, the institute was just beginning to develop the first myoelectric limbs for adults and children. Prior to that, many children went without prostheses or used mechanical arms with a hook on the end or other cumbersome device controlled by a harness worn around the shoulders. 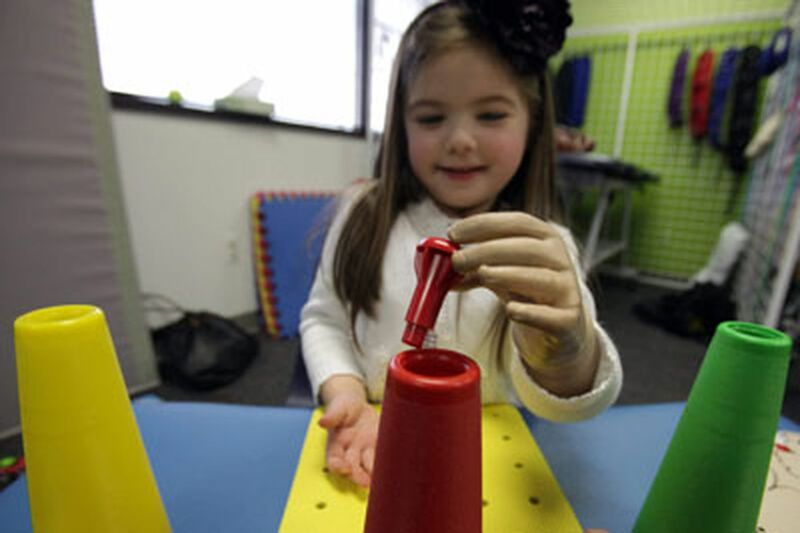 Those devices were difficult for young children to master because many are still learning the physical and cognitive abilities required to make them work, said Carl Brenner, the artificial-limb developer who has created all three of the arms at his Livonia business that Annabelle has used thus far. Annabelle gets a new device about every year as her limbs grow, "just like a pair of shoes," said Michelle Murphy, her mother. Even as recently as five years ago, Michelle and her husband, David Murphy, assistant principal at Grissom Middle School in the Warren Consolidated School District, were told by many doctors that technology for kids with upper limb defects like Annabelle's had not advanced enough to be worthwhile, she said. "They told us kids do compensate and adapt" with upper limb defects. The Murphys refused to stop there and found a Web site describing the Variety Myoelectric Center. It rang a bell for Michelle because she had worked as a teen for a woman who had been president of the local group. Michelle called her former boss, who made a call, and the family got an appointment for Annabelle to be evaluated at the center. When she was 7 months old, she was fitted with a starter limb, which has no electronics. The idea is to see if a child uses the equipment and finds it helpful with daily tasks. The program typically fits children with an electric limb around 1 year of age, Dabrowski said. "The earlier you fit them, the better," Dabrowski said. The Murphys tried not to get their hopes up that Annabelle would like the device or that it would help her. "There was a period where my husband and I had our fingers crossed," said Michelle, a former schoolteacher. Jeff Kraus, the Myoelectric Center's physical therapist who has worked with Annabelle since she received her first device, prepared her for a myoelectric arm by helping her develop shoulder and arm strength. Michelle Murphy recalled how Kraus would sit on a mat with her daughter and blow bubbles that he encouraged Annabelle to pop as they floated over her head. By 17 months, Annabelle was ready for her first myoelectric arm. She put it on and "her face lit up," her mother said. "She was old enough to understand" that just by twitching muscles in the top of her arm she could get the electronic sensors to move the thumb and two opposing fingers, Murphy said. "It took her about three months to master it." "She's a wonderful user of it," Kraus said during a recent therapy session with Annabelle. "It's amazing what she can do with it." He spent the hour of therapy tossing balls with Annabelle, playing games such as tug-of-war, and using a cardboard rabbit with a shoelace to help teach her how to tie shoelaces. When she relied on her right hand, Kraus asked gently: "What is your left hand doing? It can do more than that." "I can't," Annabelle told him. Then, without a whimper, she focused her thoughts on getting her left arm to move. Just willing it to do so makes the muscles twitch, which triggers the batteries inside her artificial arm to move her thumb and fingers to pick up the shoelace to make a bunny loop. She tied one bow, then another. "Good job, Annabelle," Kraus said. Annabelle beamed a big smile back.